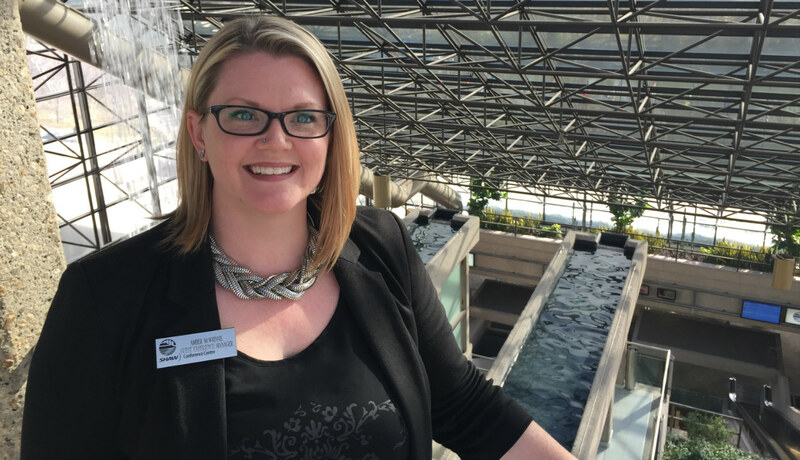 When Amber McWhinnie first walked into the Edmonton Convention Centre at 15, she fell in love with the building. The excitement, opportunity and, quite simply the architecture overwhelmed her as she began her career. Fast forward 22 years and Amber is now the Director of Guest Experience. She is the go-to person for almost everything. Ask Amber and if she doesn’t have an answer (which is rare) she’ll find out and get back to you within minutes. Amber is the woman working behind-the-scenes to make things happen seamlessly at Edmonton’s convention centre. Amber began her career in the banquet department. “I remember in 1998 we hosted the International Human Rights conference where I ended up serving one of the VIP tables that Desmond Tutu was sitting at. In the middle of his meal, he stood up and kissed my hand, thanked me for the fantastic service and gave me a blessing. I was so nervous but it was one of those once-in-a-lifetime experiences that only the Edmonton Convention Centre could offer.” She moved from Banquets to our Accounting department, and then over to our Administration team. Always having a thirst for more, Amber propelled herself forward and began to take on more and more responsibility. “I never said no to anyone. I loved hospitality; I knew this was where I wanted to be so I expanded the role for myself.” Amber took on the responsibility of office management and our venue & event management software, and began working closely with the Client Service Management teams. She changed & modified processes and continues to work tirelessly for constant improvement. Now, Amber has taken on the challenge of Director of Guest Experience, developing a department dedicated to enhancing the experience of our guests. This is a daunting task, so we had to ask, what’s it all about? “My department takes into account everything a guest experiences when they walk through our doors, making our 33 year old building look and feel great to every guest. Things like art, plants, cleanliness, maintenance and even smell are taken into account. Making sure things like our escalator modernization project doesn’t decrease the value in a guest’s experience. Many think we’re under construction when the escalators are actually being totally replaced. We’re always talking with the team about minimizing noise, mitigating potential problems and working with City of Edmonton departments to ensure ensure everything is running smoothly. Amber doesn’t look at her accomplishments as a “big deal” but she has achieved a lot. 15 years ago she was part of a team that literally moved the Edmonton Convention Centre from paper to software, essentially bringing Edmonton’s convention centre into the digital age. She did it again this past year as the venue transitioned to utilizing Ungerboeck, one of the leading software programs in the venue management industry. “It was one of the most difficult challenges I have ever faced as a leader but we’ve streamlined things for the better and it’s a huge personal success of mine.” Amber straddles two areas between Administration and Guest Experience. You’ll rarely find her at her desk so we wondered how she manages it all? In the midst of Amber’s career growth and success she also fell in love, meeting her eventual husband at the convention centre. “I actually remember the day I saw him (Ed Pilecki) for the first time, what I was wearing and where I was standing.” Amber and Ed are the quintessential power couple at SCC managing demanding schedules while raising a young family.